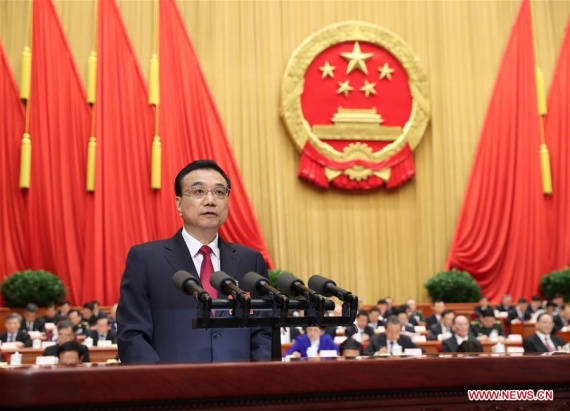 "[China will] pursue better results in actual economic work," according to the report delivered by Premier Li Keqiang at the opening meeting of the annual session of China's top legislature, the National People's Congress. This closely-watched target is a 25-year low, down from last year's actual growth of 6.7 percent. The previous low was a 6 percent target for the gross national product growth in 1992. The projected target is in line with both economic principles and realities, the report said, adding that it will help stabilize market expectations and facilitate the country's structural adjustments. It will also contribute to achieving the goal of finishing the building of a moderately prosperous society in all respects by 2020. "An important reason for stressing the need to maintain steady growth is to ensure employment and improve people's lives," Li said. This year's target for urban job creation is over 11 million, up by 1 million from 2016, underlining the greater importance China attaches to employment. "Considering our sound economic fundamentals and the capacity they bring for job creation, this target is attainable with hard work," the premier said. Jia Kang, a national political advisor and economist with the China Academy of New Supply-side Economics, said that China has set a "reasonable target" for economic growth. China's year-on-year growth has slowed for six years in a row, falling from a growth rate of more than 10 percent in 2010. "With more and more encouraging signs for economic improvement, the economy may find the bottom near this year's target," Jia said. China's 6.7 percent growth last year outpaced most other economies and accounted for more than 30 percent of global growth, according to the report. The consumer price index rose by 2 percent in 2016. Industrial profits rose 8.5 percent, reversing the previous year's drop of 2.3 percent. Energy consumption per unit of GDP fell by 5 percent, according to the report. "Both the quality and efficiency of economic performance improved markedly last year," Li said. Against the backdrop of sluggish world economic growth, backsliding on globalization and growing protectionism, Li said China is enjoying many good conditions for sustaining economic development. China has a solid material foundation, abundant human resources, a huge market and a complete system of industries. It is also making faster scientific and technological progress and owns a complete range of infrastructure, the premier said. "China also has many innovative tools and policy options for conducting macroeconomic regulation," he said. In 2017, China will continue to implement a proactive fiscal policy and a prudent monetary policy to hold the economy within an appropriate range, according to the report. While the deficit-to-GDP ratio stays unchanged from last year, the government fiscal deficit is set at 2.38 trillion yuan, a year-on-year increase of 200 billion yuan. The government will apply a full range of monetary policy instruments, maintain basic stability in liquidity, hold market interest rates at an appropriate level, and improve the transmission mechanism of monetary policy.